If you are dealing with criminal accusation in Farmington Michigan, do not go to Court without a proper defense. Your future could be crushed if you take chances against Judges, experienced prosecutors, police officers, detectives, and the awesome arsenal of resources of the criminal justice system. Winning is what ultimately matters. Having lawyer who knows his way around a courthouse, that does not hesitate when facing off against prosecutors, and who immediately rolls up his sleeves and gets to work on your case to seize every possible advantage is exactly what you need from your legal representation. Your best hope of obtaining the best results based upon your circumstances is to have a well regarded lawyer with the legal ability to fight for you. Sometimes your defense needs to be on the offensive. It is highly recommended that you contact attorney Daniel Hilf of Hilf & Hilf, PLC before you do anything further. In the highly contested and high stakes world of criminal defense, there is no room for mistakes, wrong advice, or anything short of diligent, determined legal representation. You deserve to be treated only with respect, dignity, and compassion. 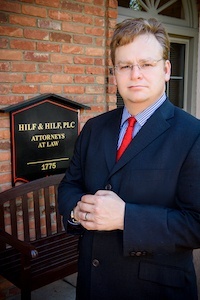 Attorney Daniel Hilf's mission is to fully defend people accused of criminal offenses. Attorney Hilf's role is not to judge or cast dispersions - he is retained to offer strategy and advice to help individuals get out from under the accusation in the best possible way. He is here to keep your confidences secret and your secrets confidential, to build the stoutest defense possible, with the goal of attempting to return your life back to normal. A false accusation of a crime isn't something that is rare, and unfortunately it is all too common. Having a innocent client actually turns the Defendant into the victim, and it makes for the toughest type of legal representation. The criminal justice system is far from perfect and in many ways broken. Innocent persons are prosecuted every day for a plethora of reasons, including: prejudice and bias; assumptions that are wrong; lies and deception; mistakes made by police officers; persons targeted by police officers; and violations of Constitutional rights. Police officers and detectives are known to jump to conclusions, and to occasionally fashion their investigations to fit a particular outcome. It is a myth that police officers and detectives make impartial and neutral judgments. Police and prosecutor tactics can increase the odds that innocent persons can end up prosecuted. Attorney Daniel Hilf makes a vow to do everything within his ability to prevent false convictions from occurring on his watch. This can only be accomplished by devoting many hours to his files, extensively investigating and thoroughly preparing cases, and summoning all of his legal acumen and resources to fight against wrongful charges. "Overcharging" is also a pervasive problem in the criminal justice system. Overcharging means that the prosecution accused someone of a more serious crime than what actually occurred. For example, a person possessing marijuana might be accused of the more serious crime of intent to deliver based upon the fact that he was found with money and a large quantity. The philosophy of many prosecutors is that if they can make an argument, they will make it and let the jury decide if it is true. Winning in a courtroom can mean different things. Sometimes winning means to avoid the more serious charge, even if it means being convicted of a less serious charge. Compassion, upholding the Constitution, protecting client rights, placing the case in the right light, and persuasion all play roles in the proper defense of a case. You are encouraged to research your lawyer and decide from all the information who will best represent you. Your research will tell you that attorney Daniel Hilf has thousands of satisfied clients, is an award winning lawyer, with over 20 years of criminal defense experience, and over 100 completed jury trials. Have you received a ticket, been charged with a crime or otherwise have to go to the 47th District Court in Farmington Hills the 6th Circuit Court in Pontiac, or some other metro-Detroit area Court? Ease your worries and anxieties by retaining attorney Daniel Hilf to represent you or your loved one in Court. Payment plans are available in many instances based upon the fact that the need for a criminal lawyer is often an unexpected offense. Hilf & Hilf, PLC accepts all major credit cards, debit cards, cash, check, money order, or wire transfer. Oakland County Criminal defense specialist Daniel Hilf provides top notch legal assistance for all tickets, misdemeanors, and felonies. Contact Hilf & Hilf today for a consultation to discuss your case. This is your opportunity to become another satisfied client. If you have been charged with a crime, contact us immediately.